I love elaborate recipes. I really do. Which is a pity, because ingredient lists can be deceiving as far as effort involved. And don’t get a steam burn! No seriously, DON’T get a steam burn. I went to pull off the aluminum foil, and my hand got in the way of the escaping steam. It was one of those burns that actually took a second to reach my brain. At first it was like, “oh that was kind of hot,” and a second later I was jumping around the kitchen waving my hand in the air like I just didn’t care. Then I remembered to run it under cold water. Hours later, I was STILL icing my fingers because they felt like my skin was melting off. Unwrap with caution, folks. 1/8 to 1/4 tsp cayenne, depending on how much kick you’re looking for. 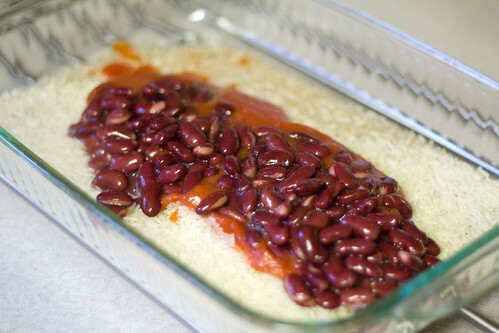 In a 9×13″ dish, pour in the rice, tomato sauce and kidney beans. Add the spices to the broth and whisk together. 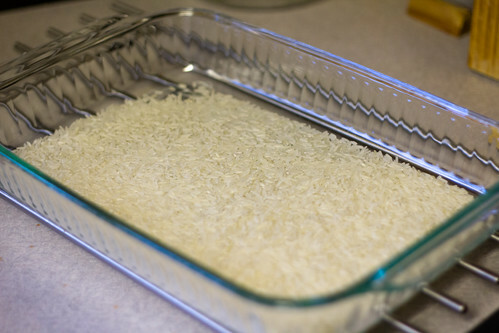 Pour the broth over the rice and beans, and give the pan a little stir. 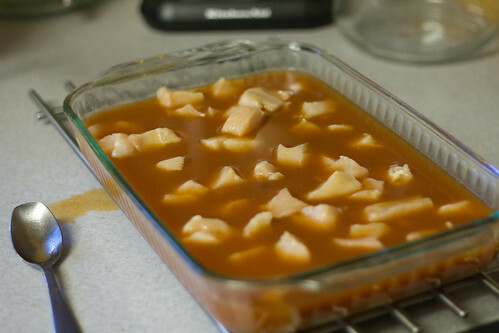 Add the chicken, and then cover the pan very tightly with aluminum foil. Bake for 90 minutes with the foil on. 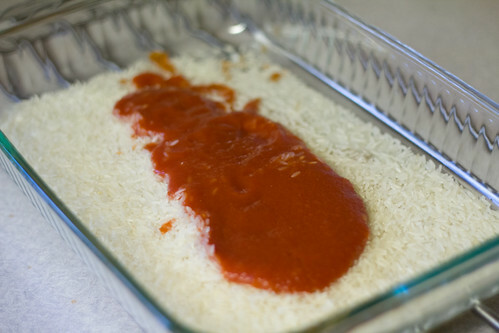 CAREFULLY remove the aluminum foil, top the casserole with guacamole, and serve. I haven’t commented on your posts for a while, which doesn’t mean I haven’t been reading and enjoying them, just didn’t take the time. Sorry about that. 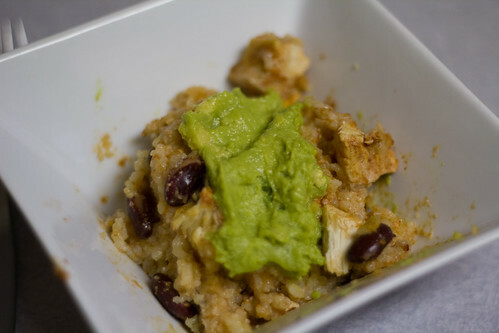 Just so you know, again, I think that your blog could easily become a bestselling recipe book! As I don’t know the technical requirements of your putting together all of 2013’s recipes in a printable format that includes all of the pictures, I would love to give it to Stephen and Barbara for Christmas! Yes, I know it is not very far away anymore, but I am not at all a person that gets started on these things in a timely fashion. I could always just do a couple and then do your entire collection as a wedding gift (or you could). They would so treasure all of your recipes, words and pictures. Have you done that for anyone yet? Let me know…..
Oh gosh, I haven’t ever tried anything like that yet, so I’m not sure how it can be done. If you find a way, will you let me know? Thank you so much for thinking of me! !